The Sun remains in a magnetic funk | Watts Up With That? 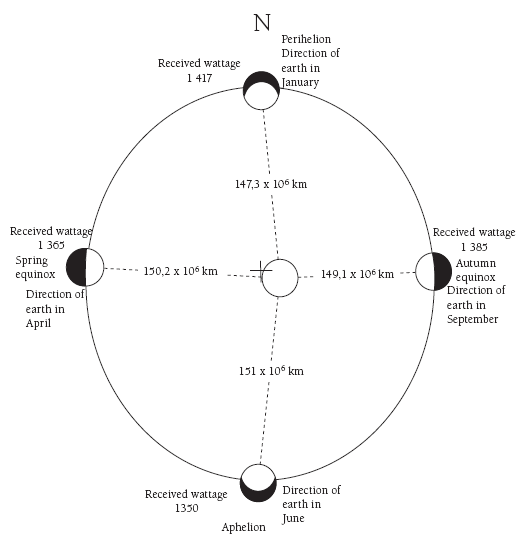 The Babcock model says that the differential rotation of the Sun (the sun being a viscous fluid, the poles rotate at a slower rate than the equator) winds up the magnetic fields of it’s layers during a solar cycle. The magnetic fields will then eventually tangle up to such a degree that they will eventually cause a magnetic break down and the fields will have to struggle to reorganize themselves by bursting up from the surface layers of the Sun. This will cause magnetic North-South pair boundaries (spots) in the photosphere trapping gaseous material that will cool slightly. Thus, when we see sunspots, we are seeing these areas of magnetic field breakdown. Sunspots are cross connected eruptions of the magnetic field lines, shown in red above. Sometimes they break, spewing tremendous amounts of gas and particles into space. Solar flares and coronal mass ejections (CME’s) are some examples of this process. Sometimes they snap back like rubber bands. 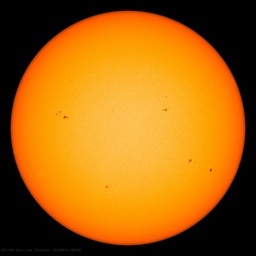 The number of sunspots at solar max is a direct indicator of the activity level of the solar dynamo. 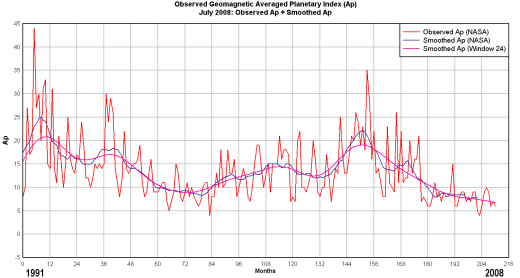 As many of you may recall, a few months ago, I had plotted the Average Geomagnetic Planetary Index (Ap) which is a measure of the solar magnetic field strength but also daily index determined from running averages of eight Ap index values. Call it a common yardstick (or meterstick) for solar magnetic activity. As you can see, the Ap Index has continued along at the low level (slightly above zero) that was established during the drop in October 2005. As of July 2008, we now have 34 months of the Ap hovering around a value between 5 to10, with occasional blips of noise. Since it is provided in the same dataset, I decided to also plot the smoothed Ap Index. I also plotted my own 24 month smoothing window plot, shown in magenta. 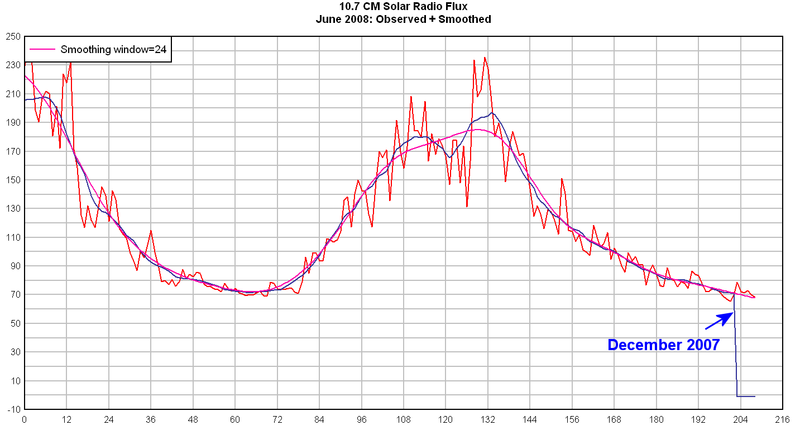 I also decided to update the plot of the 10.7 centimeter band solar radio flux, also a metric of solar activity. It is in the same SWPC dataset file as the Ap Index, in columns 8 and 9. The smoothed 10.7 CM flux value provided by SWPC has also dropped about the same time continues a downward trend. I also provided my own 24 month wind smoothed value which is plotted in magenta. 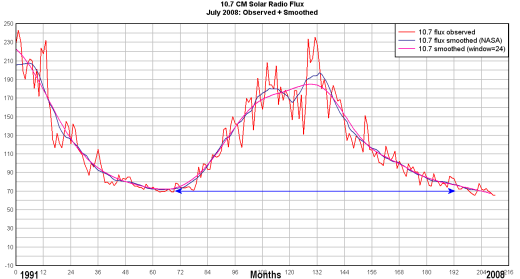 We continue to remain in a deep solar minimum, and with the forecasts being modified to push back the real “active” start of Solar cycle 24, it remains anybody’s guess as to when the sun will come out of it’s funk. 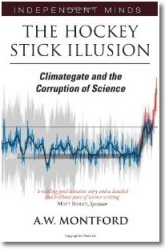 Another solar to climate amplification mechanism found? After dealing with warmists, I have very high regard for humble scientists who will admit with humor and grace that a prediction didn’t work out when it didn’t (as opposed to viciously attacking opponents and twisting data). I have high respect for Dr. Hathaway after reading that article. I think I learned more about the sun from this one article than all the science classes in high school or college. Guess I’m just a slow learner. The earth being a pretty big heat sink, it seems to me that it will take some years to cool, if the cosmic ray theory is correct. I wonder if the AGW folks can be held off that long politically, some of the schemes being talked about will spell doom for a lot of people if it starts to get really cold. We need more forced evolution! And more scary weather for us meteorologists for the oxymoron of job security. Come on cold! Bring it! If the Babcock model is suggesting dual pairs of sunspots with magnetic fields across the face of the Sun, then the lone spots we rarely see in the last 1.5 yrs or more are isolated remnant bubbles making thier way to the surface. That would indicate (if the model is correct) that there are no bands winding up at present, and that too many wound up simultaneously over the last 90 yrs, and we have a long time to wait before they get re-wound to the knotting sequence. You should not plot the ‘observed’ f10.7 flux, but the ‘adjusted’ [for distance] flux. Maybe you did, but forgot to change the label on the Figure. And since values drop below 67 on this dataset, it makes me wonder why SWPC is not offering the “adjusted” value with this data? You’d think they would recognize the importance you have pointed out to me. Do you have any explanation as to why they would not? Whatever effect the lack of solar flares and reduced magnetic activity have on climate seems, at least in the short term, to be a bit subdued. While I am no fan of AGW, I am as yet skeptical of of the solar link. The PMOD TSI-series has been degrading lately. The recent decrease of ~0.2 W/m2 is probably spurious. Comparion [ http://www.leif.org/research/DiffTSI(PMOD-SORCE).png ] with the SORCE TIM-instrument [that does have a constant, good calibration] shows this clearly. So, TSI now is probably not lower than at previous minima. It reminds me of, once again, the school bus windshield wipers. Usually they are not in sync. One is always ever so slightly wiping at a different speed. If you watch long enough, they eventually spend a few moments looking like they are once again in tandom, only to slowly get back out of whack. The Sun’s winding reminds me of that. I wonder if occasionally, over a long period, and in a somewhat cyclical pattern (over several hundred years) the rotation speeds will come into sync with one another and will rotate together for a length of time, resulting in very few sun spots and then only weak ones, because nothing ever tangles. I think your idea has merit. But I suspect the Sun will always be unpredictable so that you know Who can do what He wants and us not be the wiser. What is President Bush up to now!?!?!? I don’t know, i get sick watching him. Let me guess? Trying to start a war with Iran? Russia? China? Setting up concentration camps? I give up. It seems obvious that the shallow, extended slide is symptomatic of a slow uptake in the new cycle. 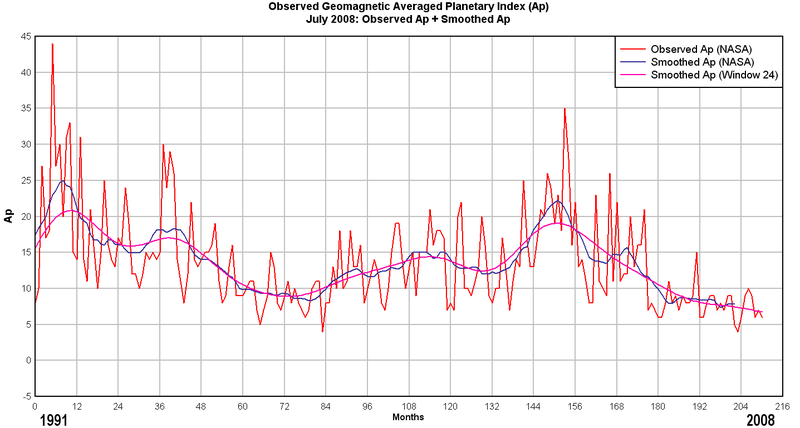 It’s too bad we don’t have better data to correlate with previous grand minima. I wonder if there is anyone “modifying” the new data to old methods of detection so at least a crude comparison may be made? Interesting number of dubya-“dislikers” (understatement?) from both right and left. Seems as his magnetism is a bit on the wane, too. (Sigh.) I just plain old like the guy and think he’s been one of our most forthright and honest presidents, particularly considering there’s a hemi-demi-semi-sort-of war on. (And I am a passionate student of history whatever else I am not.) I disagree with the man on a whole slew of issues, but I agree with him on what I consider the main ones. And, yes, I’ve traced the economic numbers (year by year) and the foreign policy positions. I think he gets a bum rap from both sides. IMO, he played AGW very smart–he kicked the can down the road to where it will either be upheld or ignored depending on what the temperatures are doing. Can’t ask for a heck of a lot more than that, really. Yes. What is important on the Earth for society is the flux observed at Earth, because that is the one that determines satellite drag and radio communications, so that is the one SWPC will report. But if you want to say something about the Sun, you must correct or adjust for the varying distance. The velocity of the “conveyor belt” is also at an all-time low. Has anyone a libnk to a page showing this. I came across it once but lost the link. Anthony, I had kind of expected a reaction to my post, like “I see”, or “baloney”, or whatever your reaction might be. REPLY: I don’t always comment right away, but sometimes wait a few minutes to form thoughts and then make a note. Note that almost an hour transpired from your initial comment to a reply to mine. While the web is instant, people aren’t always as fast. All I have to say at the moment is to repeat the question of “if you know of another dataset to use, I’m open to suggestions”. As I said some weeks ago with the first discussion, I understand and agree with the adjustement, but I don’t have a link to adjusted data at the moment. The velocity of the “conveyor belt” is also at an all-time low. Has anyone a link to a page showing this. I came across it once but lost the link. I would like to see that link, too, as I don’t think the speed of the belt has been looked at by anybody the last 5 years [that I know of]. Thanks for the update/refresher course on Ap, Professor Watts. Since your previous article on the subject, I’ve been regularly noting the daily Ap values and have seen how low and stable they’ve been. So, sunspots are but a symptom of magnetic field eruptions. Even when looking at magnetogram images of the sun, to see disturbances that don’t produce sunspots, there aren’t very many disturbances. I guess the next question is, why is the magnetic field weaker with fewer disturbances/breakages along magnetic lines of force? REPLY: I don’t have a link to adjusted data at the moment. Unfortunately, the data format changes a couple of times in the files. But this is easy to compensate for. Maybe I’ll do that and also calculate monthly means which are what you are plotting. [or better – 27-day rotational means]. The phenoma we see on the ground is not subdued. The smoke from all the fires in Ca this summer hung on the ground like an octopus on a deck. The nefariously stubborn winds that occured between last Sept. to this June are back again. Like clockwork. 110 degree weather with high winds is a phenomenon I have NEVER seen in all my years in this state. It’s hot because the winds are dead stop and High Pressure is dominant. Or so I thought. Rhodes Fairbridge reckons the Sun’s level of activity is affected by the big planets moving the solar system’s centre of gravity – when it’s outside the Sun, the Sun loops, and this “chaotic” movement tends to stop the magnetic fields winding up – if I’ve understood this right. I feel like there’s important stuff here. I shall go investigate – but meanwhile, any thoughts anyone? On another vacation, I hope. I’m almost certain he isn’t down there playing chicken with a Hurricane named Gustav. What an interesting thought! However since it is space that is warped by mass and since magnetic lines propagate through space I would guess little effect. However since magnetic lines extend further out from the sun there may be enhanced tidal effects (more so than the surface of the sun). Leif could tell you prolly, just don’t mention barycenter. David Hathaway is a proponent of the belt model for solar activity. I think he can provide that data and is very forth right in his communications. His email is accessible from his NASA solar page. David Hathaway is a friend and colleague of mine and we both serve on NOAA/NASA’s Sunspot Prediction Panel. I have asked him many times to provide that data and to no avail. Either the data does not exist or it shows something that is not palatable to him or his institution… You can try to ask him using the email address on his NASA solar page and tell us the result. Link to the Hathaway comments about the conveyor belt. When you learned about certain models in school, the model was “good enough” to help you understand the material at that level. However, not everything taught carries over to more advanced problems– those models are no longer “good enough”. The point in case here is the center of gravity from Newtonian physics. It is “good enough” to understand a one or two body problem. But when you look at a many body problem you’ll naturally notice that there would need to be extra forces to explain some strange behavior. These forces are only an artifact of the model being used. Newton’s theory of gravitation was replaced with General Relativity. In GR, these forces do not exist. It is a case of the model you understand not being “good enough” for the purpose you want to use it. Perhaps that’s what they want. The argumanet is there are too many people for the planet to sustain. Isn’t this supposed to be publicly-owned data? Well, I guess I have to take a stab at getting it. Thanks Anthony for the post, especially as it points up the obvious fact that these proxies(SS, 10.7cm, AP) for solar activity are not equivalent, but arise as effects of an apparent common cause, which we, in part, conclude from the similarity of the graphs following smoothing. I don’t understand why this does not suffice as justification for publishing the SWPC data as is. Is this a ‘Solar Blog’ run for solar physicists? For that matter, why would one publish TSI from 1 AU in preference to TSI at the earth? To me, this is an earth-centric forum and I like it that way. The spots locale is the sun, the AP’s locale is the earth, no adjustment is necessary. Where the radio flux or TSI is taken is a matter of preference and common interest not prescription. We are capable of understanding this difference, but solar activity at the earth is my preference as it is more meaningful. In recent years, however, the belt has decelerated to 0.75 m/s in the north and 0.35 m/s in the south. “We’ve never seen speeds so low. And the ‘recent years’ he refers to is 2000-2003. Dikpati et al.’s 2006 paper says that they “expect the next cycle to to 30% or 50% higher”. The reason for the two numbers is that they estimates of the ‘belt’ speed up to the year 2003 and did not know what the speed was after that or how it would change in the next few years. So based on two different assumptions about how it would change, they came up with two different predictions. Now it is five years later. If new data up to the present existed, that new data should have told them which way the change [if any] went and should have enabled them to refine the prediction, or at least to select one or the other of the earlier choices. They have not done that because no new data has been forthcoming. The NOAA/NASA Panel on Sunspot Prediction has repeatedly urged that new data be produced and the model rerun with up-to-date input, but this has not happened. More on the ‘conveyor belt’ speed: The ‘scientific’ term is the ‘Meridional Circulation’ [abbrev. MO], but ‘conveyor belt’ has become popular because of its more descriptive qualities. The MO can be observed at the surface in two ways, 1: drift of sunspots in latitude, and 2: direct measurement of plasma flow using the Doppler effect. A typical value for MO is 20 m/s at mid-latitudes. [I don’t know where Hathaway gets ~0.5 m/s from]. Inside the Sun, the MO can be probed using helioseismology, but those measurements do not extend very deep [yet] and the return flow at the base of the convection zone has never been observed. The return flow is much slower than the surface flow because the plasma density is much higher. The speed of the MO sets the length of the solar cycle in most dynamo models. The slower the speed, the longer the cycle. In fact, they are inversely proportional: Length (years) = 200 / (speed in m/s). [Try to insert Hathaway’s 0.5 m/s and see what the cycle length becomes…]. Nobody shows plots of TSI at the Earth [show me one]. TSI is always reduced to 1 AU, because that is the relevant parameter when discussing solar changes. You have probably heard that TSI changes 0.1% over the solar cycle and people wonder how much climate impact that has. TSI changes 70 times as much over the year, but that you never hear about. You preference is your own as you see fit, but in a discussion about what the Sun is doing, the Earth doesn’t matter. After all, the title of this topic is “The Sun is in a magnetic flunk”, not “Over the past three months we have been farthest from the Sun”. In the end, I think Anthony plotted the ‘observed’ values simply because he did have handy the ‘adjusted’ values that he really wanted to plot. Thank you, for every word. “but in a discussion about what the Sun is doing, the Earth doesn’t matter”. Tell us what point Anthony made or inferrence expected or the reader that is facilitated by your “adjusted data”? The data isn’t ready for his use because it is so infrequently considered at all. Rather like your argument above, ‘eh? In the former case any one like Bob Tisdale or Erl Happ or Dave Archibald can prepare graphs of solar TSI at the earth, resulting Insolation (before albedo is accounted for), etc., because of their interest in climate. This is hardly as arcane a use as 10.7 cm flux, adjusted post fact, for point of origin. Speaking only for myself, I come here because this is a Weather/Climate blog that investigates the periphery. If a point is made about the sun so much the better. I think you are overstepping here, Sir. Tell us what point Anthony made or inferrence expected or the reader that is facilitated by your “adjusted data”? 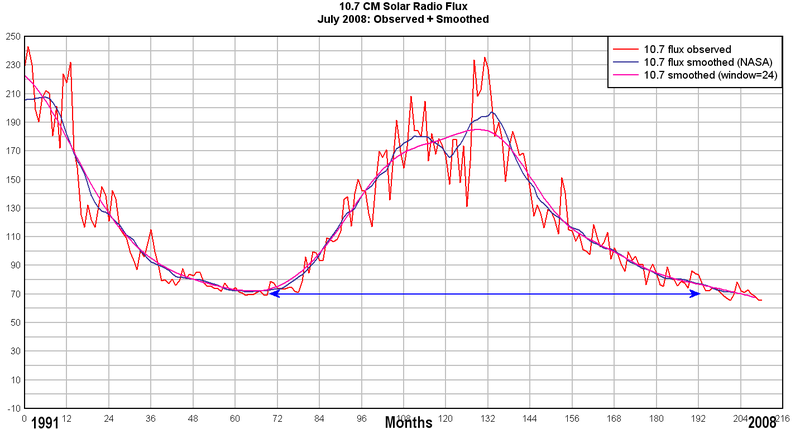 I also decided to update the plot of the 10.7 centimeter band solar radio flux, also a metric of solar activity. He clearly intended to plot a metric of solar activity, not of the variation of the distance to the Sun. I think you are overstepping here, Sir. Expecting to come to this site with data formatted to your liking to no useful purpose is a tad obsessive don’t you think? The accuracy of your adjusted data, in this particular case, is not empirically established in real time for any region in space. Why the bother? You tilt after windmills and hope to catch your adversary in some trivial misstep. 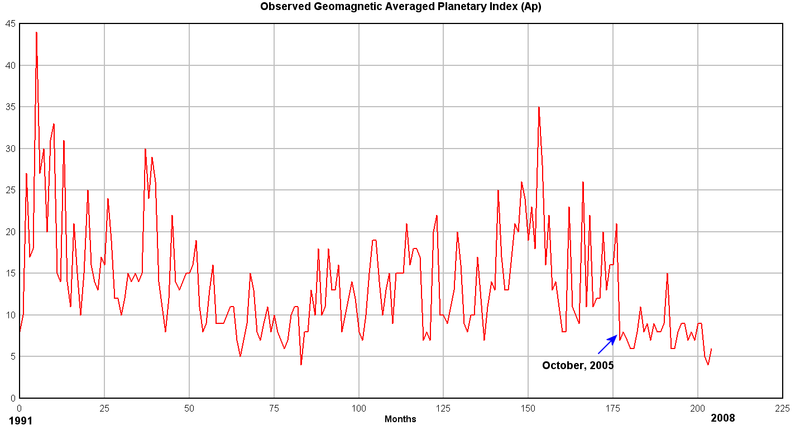 Again the interest of the plurality is in the role of solar activity re: climate. 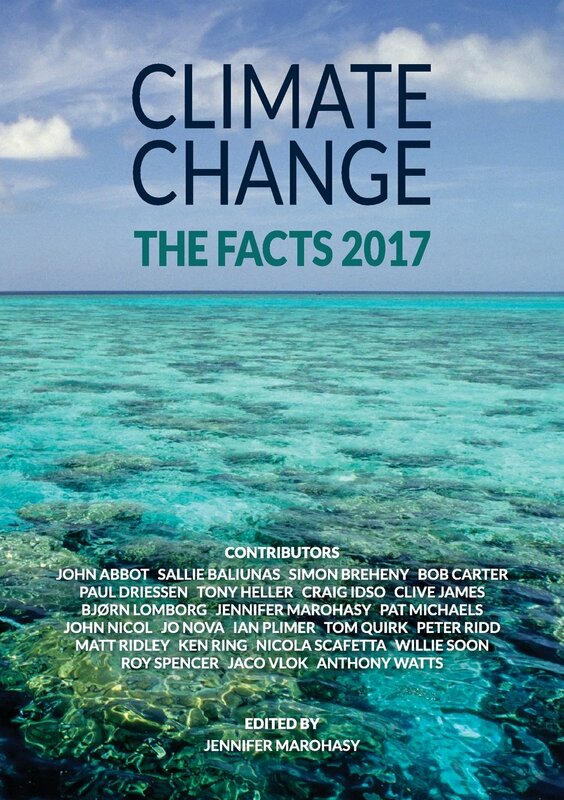 We acknowledge, we grant your point that variance in solar TSI at the photosphere is not sufficient to explain climate change. The implication, however, that this makes AGW a whit more plausible is daft. REPLY: Gary, I’m in agreement with Leif on the adjusted data for 10.7cm flux. This adjustment is strictly about applying physical law, the inverse square law to measurement of the radio signal as the earth’s distance to the sun changes with orbit. I am reminded of Alexander the Great and the Gordian Knot. How long before someone puts this debate to bed? Expecting to come to this site with data formatted to your liking to no useful purpose is a tad obsessive don’t you think? The correct data should be used; not for my sake, but for the sake of thousands of other readers [including you] that deserve a scientifically sound comparison. The accuracy of your adjusted data, in this particular case, is not empirically established in real time for any region in space. Why the bother? It is not ‘my’ adjusted data. The adjustment is made by the radio observatory that make the observations and is very, very accurate. You obtain the adjusted flux by dividing the observed flux by the square of the distance to the Sun [in AUs]. This number is known to 10 digit accuracy, about 10 million times more accurately than the flux measurement itself. such ad-hom remarks are not appreciated and put you to shame. The implication, however, that this makes AGW a whit more plausible is daft. I think I found the toe. You are jumping to the wrong conclusion that the question about solar influence on climate has anything to do with AGW or anti-AGW, and that my opinion about the evidence for solar influence is based on or related to the AGW-debate. It is titled “Linkage Between Solar Activity, Climate Predictability, and Water Resource Development.” The authors see a link between sunspots and rainfall and the flow of the Vaal River in South Africa. David, if I may be so blunt, the article is bunk. The highly twisted IMF does not permit this to be other than a highly idealized representation, sorry. While we will accept that this is the best we can do, you have not attempted to show why the consistent use of SWPC near-earth data is not as good or better than your adjusted data and moreover of more use to readers of disparate focus. Your characterization is inapt. The metaphor clearly follows from my assertion that the issue is overwrought. You disagree, fine. Raphael – thanks, I’ll work on that – but it looks as if Carsten Arnholm has material on this issue here – just picked this up from the No Sunspots post. Lief. Thanks. But since I am an attorney, not a scientist, could you explain why? If you only have a general knowledge of gravity, the idea can appear convincing. You have a level of understanding. You see strange behavior in that model that require extra forces to understand. It is natural to wonder what effect those forces have. You better be sorry, because the highly twisted IMF has absolutely no effect on F10.t which are electromagnetic waves getting to us in 8 minutes. I know, I cannot assume that everyone is versed in elementary science, and that it is our duty as scientists to provide the public with the information it deserves, one would recommend a little bit of restraint on your part when you are that far off the mark. Leif. Thanks. But since I am an attorney, not a scientist, could you explain why? As an attorney you might appreciate that if one can show that a part of a witness’ statement is false, that casts doubts on the veracity of the rest. Take a look at Figure 10. I have a link here for convenience. Note that the authors subscribe to the [unphysical] barycenter notion and compute the Total Solar Irradiance (TSI) at different seasons depending on where the Sun is with respect to the barycenter [TSI depends on the distance to the Sun – it varies 7% through the year]. The numbers they give (1417, 1365, 1350, 1385 W/m2) are plainly wrong. We have very accurate satellite measurements of the TSI that deviate very much from what the author’s understanding is. I have a plot here that shows the observed [black] and purported [red dots] TSI-values. There are other serious criticisms, but this one here shows their lack of understanding of basic science. I rest my case. Leif – not being a scientist I have no opinion either way on the conveyor belt – I was just posting a link to to Dr Hathaway’s comments regarding it. I don’t pretend to understand it! I suppose one could presume that Dr Hathaway continued to monitor the speed post 2003 – although I think he said in the article that he used the drift of sun spots to measure the speed, which must be a little tricky when there aren’t any sun spots! If, as you say, this is how they determine the strength of the next solar cycle – or one of the factors – then I suppose the question should be – what is the conveyor doing now and if they have stopped measuring it post 2003 – then why? Perhaps it is “normal” again – but if they won’t reveal the data how can anyone know? I’m going to investigate this business further… beam me up Scottie…! I would think that our solar systems travels through space would have more to do with the suns behavior and ultimately our climate than the current science accounts for. We ( the solar system) are traveling through space and minute by minute are influenced by forces that have yet to be realized, we are not stationary but traveling through space and are continually entering and leaving other terrestrial bodies sphere of influence, to give some idea to the problem, sprinkle some iron filings on a glass top table, then try and predict the form they will take after you pass a magnet under the table at various speeds and distances. Leif, I appreciate the difference between what the Sun is doing objectively, and what we see/measure on Earth. That is why so many are working on sending instruments towards the Sun, so we can measure it outside of the relativity created by Earth. Makes sense. I also see the other side of this discussion. If what we want to measure is our Earth’s interaction with what the Sun is doing, we would want to measure things from Earth’s perspective. That is why so many are working on sending instruments towards our atmosphere to measure CO2, ozone, cosmic rays, UV, etc, as well as here on the ground. Climatologists need objective information about the Sun. But they also need that same information as it travels through our atmosphere so that they can hypothesize theoretical constructs and test them in the lab. I believe rudimentary cloud chambers tried this and now these scientists are on to bigger chambers. Two separate scientific fields of inquiry. I get it. The argument for or against adjusted TSI falls due to the cross purposes of the data in question. One side is arguing for apples, the other side oranges, and the apple group is insisting that you, the orange group, measure the Sun from Earth so that we can all be happy apples. I can see that you want information about the Sun, regardless of what planet you are standing on. I can see that the apple group wants data about the Sun that is measured through Earth so that we can continue the discussion of the Sun’s influence on our climate. I’m chuckling. On another blog I made the argument a few days ago that if you couldn’t trust one piece of evidence, then it caused all other evidence of a similar nature to be questionable as well. I was told by a scientist that my argument was very “anti-scientific.” The issue at hand was videos, and I pointed out that if one video was proven to have been faked, then one should be skeptical of all other videos on the subject. The ‘scientist” insisted that this was not science and that indeed each video should be proven to be legitimate or a fake, and that was the scientist’s job to be skeptical of all and prove the validity or invalidity of each one. Oh well. I can’t win. why 200 by the way? It isn’t a controversial issue, it really is a non-issue. However, I do beleive it is understandable that you may feel that there is something to it. The best way to investigate is to solve the GR equations and show yourself the extra forces do not exist. If your math skills are not up to the task, ask someone who has solved them and (provisionally) accept their answer until you develop the skill to show yourself. The argument for or against adjusted TSI falls due to the cross purposes of the data in question. It is simpler than that. Both raw and adjusted data are equally available, you pick the one that fits your purpose. If your purpose is to point out how quiet the Sun is, you pick the Sun-centered one. I’m chuckling. On another blog I made the argument a few days ago that if you couldn’t trust one piece of evidence, then it caused all other evidence of a similar nature to be questionable as well. What interests me is if my was compelling for you. The ’scientist” insisted that this was not science and that indeed each video should be proven to be legitimate or a fake, and that was the scientist’s job to be skeptical of all and prove the validity or invalidity of each one. There is some truth to this as well. For the case at hand, my comment showed a lack of basic scientific understanding and that carries over to all the rest. Well, if you accept the strong plausibility that the paper was indeed bunk, then we both win. I would like to know this too. I guess that I could investigate for myself [the data is publicly available], but your guess that a lack of spots makes it hard is a good one. Certainly, the sunspot method would not give meaningful results for 2007-2008. I am writing a paper for my website about the Sun’s influence on global climate. You produce some of the finest charts that can be found on the web. Do you permit copying and use of your charts with attribution to you? 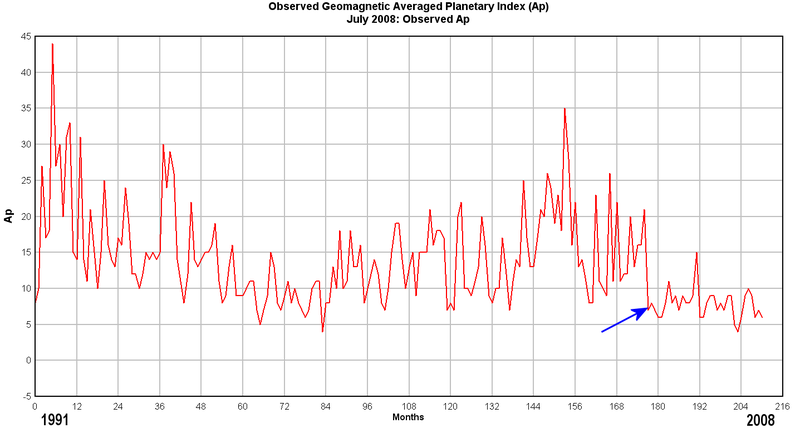 I would like to use your chart the sun’s geomagnetic activity and your chart of UAH global temperature since 79. Raphael, maybe you are right, maybe it’s a non-issue. But my curiosity is now aroused! Scuse my ignorance but what is GR? Galactic Rotation or General Relativity? And BTW, quantum theory trumps Einstein and then its zero point field proves the truth of both e=mc2 and f=ma (Newton). GR = General relativity. I used both in my first reply to you. I’ll make sure to be more specific in the future. I never said to ignore the issue because it is a non-issue. I said solve the equations and prove it to yourself. Curiosity is good. Blind faith is bad. Indeed, I was off the mark; the radio flux is comprised of bosons after all. Of course, the orbit must decay (and the stars eventually coalesce) by gravitational quantum mechanics. I allowed at the time you were “confused”. A bit more measured response, ya’ think? Pingback: NASA’s press conference on the state of the sun « Watts Up With That?